Well Valentines Day is coming up and this would be a nice touch if you want to impress that artists in your life. Or maybe an art project, for you teachers out there. It is quick, easy and has a personal touch. 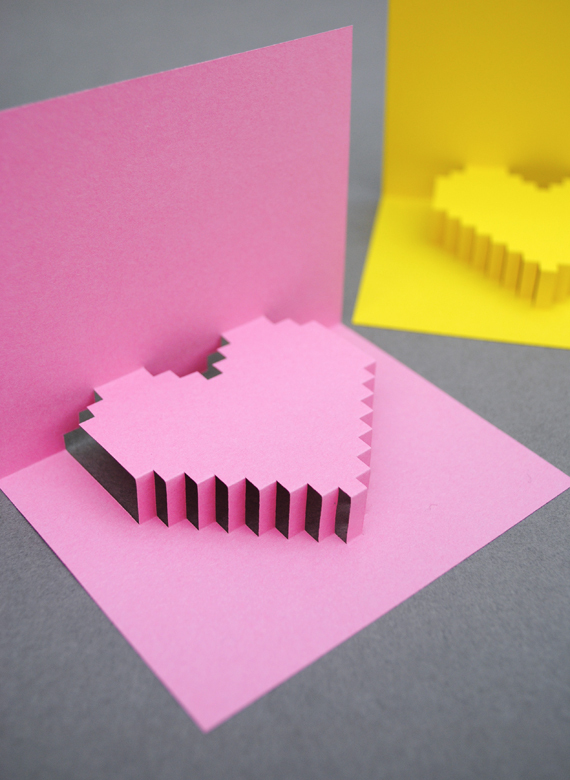 Here is a link to the instructions of how to make this pixalized Valentines Pop Up Card. Neat Post, To send Valentine cards, you need to know who your recipient is. Valentine’s Day is usually a day for lovers but, those in platonic relationships also celebrate their love with deep affection. It is pretty interesting how different people celebrate the special day. Many will complete the ritual and send Valentine cards to the people they love. They are used to communicate a deeper love that cannot be expressed by word of mouth. Many cards represent an awesome affection that is the building block of all relationships. Know the person you are sending the cards to well if you really want the cards to make the desired impact. There are very many people who just send the nearest one they find. If you really want to show that you care deeply, it is time to take a break and focus on getting ones that will make the day extra special. You have to be close to perfection for any card to really speak. This is because many people receive them but, do not associate them with any special love.